Now in their fifties lead guitarist Steve "Lips" Kudlow and drummer Robb Reiner are still desperately trying to make it big with their band Anvil. The documentary chronicles the duo's passion since they were fourteen to become Heavy Metal superstars like Metallica, Slayer or Megadeath up to recently when they made their thirteenth album still trying to achieve their boyhood dreams. "Anvil! 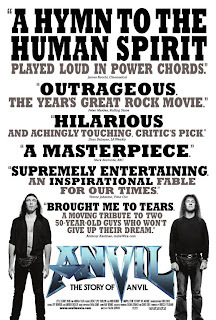 The Story of Anvil" is a bittersweet documentary that has you wishing the all best for Anvil regardless of whether you like Heavy Metal music or not. The passion presented onscreen by Steve Kudlow and Robb Reiner is absolutely vivid and ressurects a raw array of emotions ranging from joy to sorrow for the desperate band. What makes "Anvil! The Story of Anvil" so touching and inspirational is the duo's determination to continue on regardless, of all the doors that have been shut in their face. The Canadian group has been together for over 30 years and they still keep pushing despite the obstacles and tragedies they have faced. Steve "Lips" Kudlow steers the story through his narration and provides some great laughs along the way. He provides a pure look inside his world as a every day male who has always dreamt of being a rockstar. Throughout the film the viewer can see Kudlow's passion and quickly develops a general desire to see him succeed in his dreams. Watching as Kudlow pushes his dreams as he is faced with one disappointment after another is heartbreaking, but his determination is a testament of the human spirit. I was particularly found of the more human moments with Steve Kudlow in the film, i.e. is fights with long time friend and drummer Robb Reiner, his childlike amazement of his musical peers who had gone on to actually be rockstars and his day-to-day life working a regular job. Robb Reiner presents a different take on the band's legacy. Robb shows a more frustrated side to the band Anvil. He, like Steve Kudlow wants to make it big, but has sat by and watched as Steve has squandered or made poor choices along the way. Reiner was at one time considered one of the best Heavy Metal drummers in the world and was a inspiration to flocks of up and coming drummers. To be later passed by the those upcomers has weighed heavily on him and he now looks as their thirteenth album as a last resort to finally hitting it big. Reiner is much more reserved throughout "Anvil! The Story of Anvil" however, the same passion and determination seen in Lips, shines through his hardened exterior in brief moments when he argues with Steve Kudlow. Director Sacha Gervasi does a fabulous job of piecing together old Anvil concert footage, interviews and new material to create a powerful story chronicling the band's pursuit of a dream. Some of the most powerful footage comes from interviews of family, friends and peers which resinate home the will Steve and Robb have for their band Anvil. One interview in particular shows Lars Ulrich of Metallica claims that Anvil was one of the most influential bands of the 80's Metal scene. Ulrich went on to say how he was surprised that they never made it big and how crazy it is that they are still making records after all these years. His point goes noted, but I quickly wondered if Metallica respected Anvil so much, why had they never put them on tour with Metallica? Certainly touring alongside Metallica would have boosted their popularity. Most of the family interviews are hard to watch, because you can clearly see how both Steve and Robb's decisions have weighed heavily on their perspective families. Luckily for both men, their families love them dearly and only want the best for them, even if it means hard times for the family. "Anvil! The Story of Anvil" is inspiring documentary that illustrates the determination and will power within us all. Steve Kudlow and Robb Reiner demonstrate a rare passion and tenacity to make their dreams come true, one that is a true joy to watch on screen. The film does leave the viewer hoping that success would one day find the aging band, ultimately leaving you with somewhat of a bittersweet result. That said, the reality is so few bands ever make it big and to see a band such as Anvil go on for thrity years and are still trying illustrates the testimony of our will to succeed, making "Anvil! The Story of Anvil" a film not to be missed.